I recently began a 100 day project called "100 Days of Hand Stamped Fabric". Every day I carve a rubber stamp, print it on graph paper in a repeating pattern, and finally, print it on fabric. Whether I'm stamping directly on graph paper, or on fabric with the faint lines of the graph paper showing through from beneath, the placement of my stamp is guided by a grid. This project is not my first use of the grid in my artwork. Initially I was inspired by the painter Adolph Gottlieb. It was several years after graduating RISD. I was living in NYC, working in publishing, and attempting to build my freelance illustration career on the side. At that time, I was working towards developing my visual style. I began an early morning routine in which I'd wake up, make myself a coffee and pick an art book off one of my bookshelves. Then I'd spend an hour looking the artist's work. If there was some element of the art that I loved, I'd make note of it so I could experiment with it in my own work. That particular morning I picked Gottlieb. As my hour with Gottlieb's book of paintings drew to close, I'd made note of my observations to come back to them at a later time. Several days or weeks later, while working on an illustration to use as a self-promotion, I incorporated several of these stylistic elements into my design process. My illustrative style had already made use of the first three elements listed above, but the image below was my first to make use of symbols to represent the idea and/or feeling I was trying to convey, as well as the use of a grid to organize them into a cohesive whole. Designing on a grid was somewhat of a breakthrough for me. After releasing this image as a self-promotion, I received more calls and assignments than I had from previous promos. This allowed me to dedicate all of my time to my freelance illustration business (rather than work in publishing as I had been, and illustrating on the side in my free time). This series of paintings that I'd felt such an affinity to are referred to as Gottlieb's Pictograph paintings. You can see more of them on my Pinterest board "Art on the Grid" (along with some other works of art that make use of the grid.) If you'd like to read more about the artist, The Adolph & Esther Gottlieb Foundation is a good place to start. 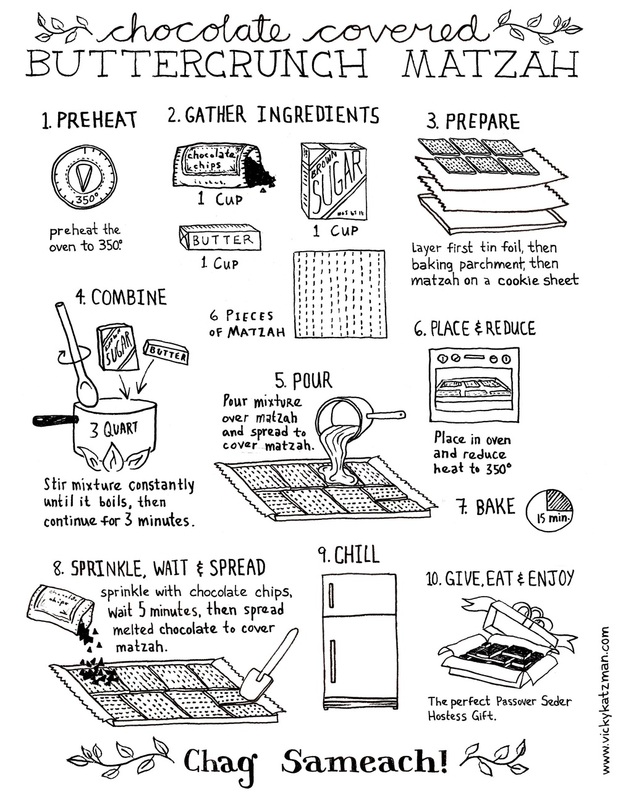 I've been wanting to illustrate a recipe, and now that Passover is here I thought I'd work on the most delicious, addictive Jewish holiday dessert ever - Chocolate Covered Buttercrunch Matzah! In addition to exploring recipe illustration, this is my (a little too late) attempt to add a personal touch to the holidays. I had planned on actually MAKING the dessert to bring to my sister's Seder, along with print-outs of the recipe for the kids to color. With time running short, I still need to hard-boil and peel two dozen eggs, make the Charoset, and bag up the chametz. Looks like I may not be getting to this little project after all... but there's always next year. Another idea I'd had was to print this out onto card stock, reduced, and use it as a gift tag to accompany a tin full of the buttercrunch matzah. I'd give it as a little spring-time gift to Hebrew school teachers or anyone else I've been feeling grateful for. If you'd like to use this image for a personal project this Passover, feel free to print it out. I'd love to see what you do with it, so send pics if you can. 1. Choose your fabric. I'd recommend any of the 100% cotton ones. I use either the Basic Cotton Ultra or the Kona Cotton. Both of these fabric widths fit the Shabbat Shalom design with minimum fabric waste. 2. Choose a size and amount. You'll need 1 fat quarter. Find a piece of plain white cotton fabric or anything you'd like to use as the underside of your challah cover. Pin right sides together and sew along dotted line. Leave a small opening about 5" wide. Trim excess fabric .25" away from seam. Trim corners to reduce bulk. Turn right side out. Use something long and thin (like the eraser side of a pencil) to push out the corners. To close opening, tuck ends of fabric under .25" and pin. Hand sew closed. Optional, for an extra special touch, use silver metallic thread to outline illustrations and along the edges of the border. Your challah cover is now complete! If you'd like to share a picture of your finished project I'd love to see it. On instagram I'm @vickykatzman or you can e-mail me at vicky@vickykatzman.com. I hope you use your handmade creation for many years to come. Shabbat Shalom!